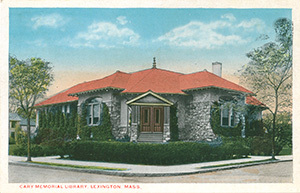 In addition to hundreds of books about the Battle of Lexington, Cary Memorial Library has a substantial collection of materials on life in Lexington from the Colonial and Revolutionary periods to the present day. These materials are found primarily in the library’s Lexington Collection and the Edwin B. Worthen Collection, described below. Materials in the Lexington Collection include published histories, Town reports, planning and zoning studies, Lexington High School yearbooks, family histories, newspapers, vital records, voting lists, street directories and vertical file materials, as well as histories of surrounding towns. These materials may be found by searching for specific topics in the Minuteman Library Network’s catalog. For more information about Lexington’s people, places and events, browse through a detailed listing of local history materials and resources. Donated to Cary Library in 1976, the Edwin B. Worthen Collection documents life in Lexington from the early 19th to the mid-20th centuries. In addition to approximately 500 books, the Worthen Collection includes manuscripts, pamphlets, photographs, lantern slides, scrapbooks, maps, drawings, sketches, correspondence, research notes, vertical file materials and memorabilia. Subjects covered by the collection include Lexington’s people, properties, landmarks, businesses, organizations, schools, celebrations, and Town government. These materials may be explored in detail by visiting the Worthen Collection’s “Virtual Exhibit” www.carylibrary.org/special/worthen. 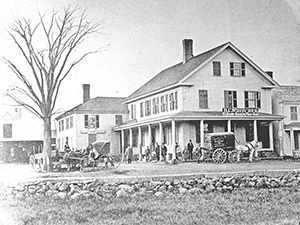 In 1827, Town Meeting members voted “that sixty dollars be raised by tax for establishing a Juvenile Library.” In 1867, Mrs. Maria Hastings Cary offered the Town $1,000 for books if a free public library was established; in 1869, Cary Library was opened to the public. Located over Bradford Whitcher's (later Spaulding's) Store, which stood on Main Street (now Massachusetts Avenue) opposite Merriam Street, it was open from one to five on Wednesdays and from one to eight on Saturdays. 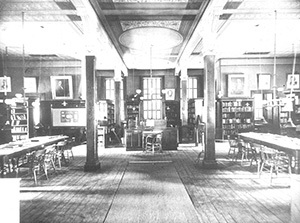 By 1871, the library had outgrown its original location and was moved to the first floor of the Town Hall, which had just been built on Massachusetts Avenue opposite Waltham Street. Mrs. Cary had provided $20,000 toward the building of Town Hall and, until her death in 1881, generously supported the library and left an additional $5,000 in her will. 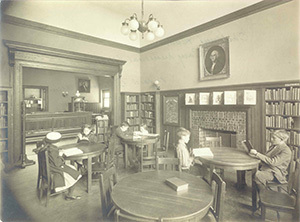 In 1906, Cary Library moved into new quarters at the corner of Massachusetts Avenue and Clarke Street, where it stands today. The building was the gift of Miss Alice Butler Cary in honor of her foster mother. Originally designed by architect Willard Brown, the building faces the Minuteman Statue and the historic Lexington Battle Green. Need additional information or research assistance? Ask a Librarian.